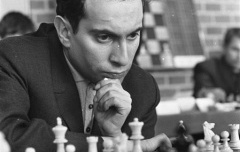 Tal, nicknamed the “Magician from Riga,” was a genius who overwhelmed his opponents with dazzling attacking chess. Subsequently many of his attacks could be shown to be “inaccurate”, but until ill-health took its toll few were able to demonstrate that at the board. Tal’s rise was meteoric. He qualified for the USSR Championship aged 19, became the youngest ever player to win it the following year and held onto the title again a year later — he would eventually win that formidable event six times. His path to the World Championship was remarkably smooth, winning the 1958 Interzonal and the 1959 Candidates Tournament, where he scored a 4/4 clean sweep against the young Bobby Fischer. The 1960 match against Mikhail Botvinnik was one of the most anticipated in chess history and saw the young star bamboozle his experienced opponent with daring sacrificial chess. Tal raced to a 5:2 lead after seven games and eventually emerged the 12.5:8.5 winner, to become the 8th World Champion. Tal was unable to maintain such phenomenal form and success. In the rematch a year later Botvinnik was prepared to counter his opponent’s aggressive style, and Tal’s poor health contributed to his losing the title after a 13:8 loss. He never again qualified for a World Championship match, although he spent almost three more decades close to the top of world chess. In later years he transformed his style to become one of the hardest players to beat, posting record 86 and then 95-game unbeaten streaks in the early 1970s, when he was working with the young Anatoly Karpov. Tal was a fine blitz player, winning the official World Blitz Championship in 1988 at the age of 51, and defeating Garry Kasparov in the Moscow blitz tournament of 1992, just a month before his death. Tal’s universal talent was clear in the fact that he started studying literature at the University of Riga at the age of only 15, and he would later develop into one of the most entertaining chess writers. A heavy drinker and chain smoker, Tal had a kidney removed in 1969 and eventually died of kidney failure at the age of only 55. Did Tal understand Eastern military philosophy? He used the element of surprise! We miss you, Tal. So far the best player ever; Nowadays chess players (Even top GM's) don't play for attacking bomb sacrifices, they play like an engine waiting their opponent to blunder. Tal has said when alive: "When you wait luck, life becomes boring"; And he is right. Such a shame Tal died so young. Perhaps the greatest attacking player the world has ever seen and if not for his ill health, he would of been perhaps one of the greatest world champions! you are right "He was really a great attacking player"
Unique ! A chess hero..The curse of an engine? Never be a TAL !